This year in science saw important developments, including a few surprises—but, many of 2018’s most significant events were the products of ongoing social and political trends that have been in motion for years. The year 2018 saw renewed debate about the urgency and efficacy of policies to limit climate change, against a backdrop of severe weather events and at a time when the U.S. government continues to roll back environmental regulation. It was also a year when both CRISPR and artificial intelligence (AI) revealed their growing potential for innovation across many fields, even as researchers expressed concern that these technologies were developing at speeds too fast to assess and evaluate their impact. NASA continued its exploration of the solar system, and Americans had the opportunity to watch, in real time, the harrowing landing of the InSight probe on Mars. But, the public was also fixated on the launches of SpaceX’s revolutionary, reusable rockets—the latest chapter in the rise of private space companies, as the Trump administration continues to look for ways to outsource and commercialize U.S. space exploration. This year the #MeToo movement continued to shed light on workplace inequality and sexual harassment. The movement, which had initially exposed misconduct in the entertainment and media industries, has also revealed a culture of entrenched discrimination in STEM jobs, most visibly in Silicon Valley. After years of debate, and millions of dollars to promote diversity, women and racial and ethnic minorities remain underrepresented in tech—and in many STEM professions overall. Two reports published this year—amid months of extreme weather events including massive hurricanes, droughts and wildfires—reveal the full extent of the challenge in mitigating the impacts of climate change. According to a survey conducted by Pew Research Center, most people believe that the government can do more. Two thirds of Americans (67 percent) say the government is doing too little to reduce the effects of climate change. Political leanings have a profound influence on how Americans view government activity on climate issues. Roughly nine in 10 liberal Democrats (93 percent) believe the federal government is not doing enough to reduce the effects of climate change, compared with 22 percent of conservative Republicans who say the same. 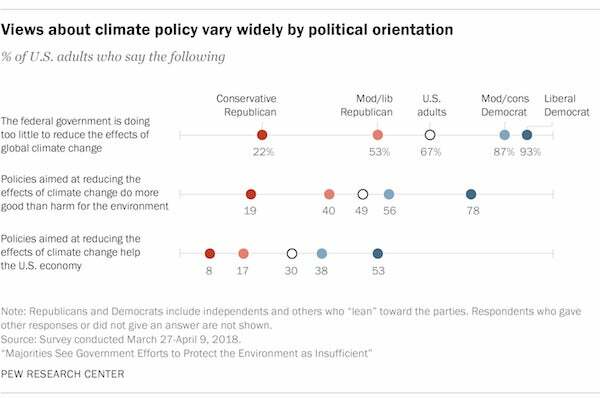 There are also wide political divides over beliefs about the consequences of policies aimed at climate change. For instance, 53 percent of liberal Democrats believe policies aimed at reducing the effects of global climate change generally help the U.S. economy, compared to just 8 percent of conservative Republicans who say the same. Artificial intelligence (AI) has continued to demonstrate its wide-ranging impact in diverse areas that include cybersecurity, economics, automation and medical care. Just this month, Google’s DeepMind project announced the development of its new AlphaFold system, which has the potential to predict the 3-D shapes that specific proteins will fold into—a uniquely useful tool in understanding diseases such as Alzheimer’s that are thought to be caused by misfolded proteins. But some in the scientific community continue to express concerns that we might be entrusting too many tasks to AI when we can’t accurately anticipate the outcomes of its decisions. In August, a group of researchers published a series of anecdotes demonstrating how artificial organisms in a digital environment often evolve in ways that are difficult for researchers to predict in advance. Pew Research Center surveys have found that Americans tend to be wary about advances in robotics and AI. The foremost insight from these studies is that people’s unease with emerging technologies stems in part from concern over the potential loss of human agency and free will. Similarly, Pew Research Center surveys have found Americans uneasy about biomedical innovations that could significantly alter human capabilities. Indeed, concern over public reaction was among the reasons the scientific community was alarmed by the announcement in late November that the first gene-edited babies—reportedly rendered immune to HIV—had been born in China. The birth of actual “designer babies” went well beyond previous lab studies of embryos. If not properly regulated, researchers worry that procedures such as this could lead to a wider public backlash against CRISPR technology. A survey conducted by Pew Research Center prior to this development finds that Americans are supportive of using gene editing technology on babies, under certain circumstances. About seven in 10 people (72 percent) say that changing an unborn baby’s genetic characteristics to treat a serious disease or condition is an appropriate use of medical technology. A somewhat smaller share of Americans (60 percent) say gene editing to reduce a baby’s lifetime risk of developing a serious disease or condition is appropriate. 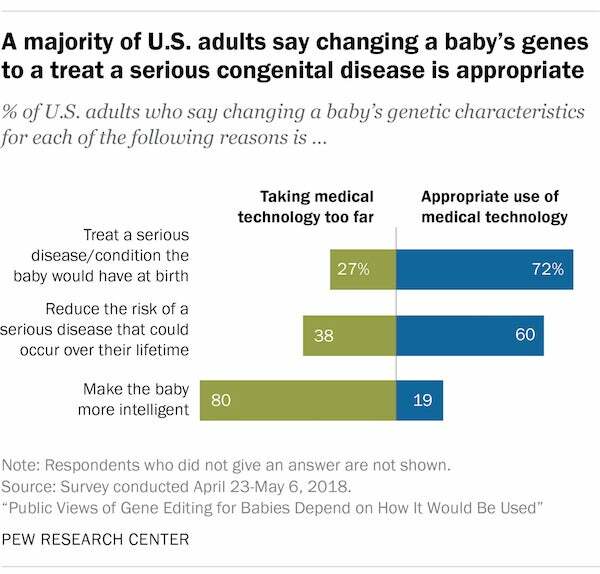 But just 19 percent of Americans say it is appropriate to use gene editing to make a baby more intelligent; eight in 10 (80 percent) say this is taking medical technology too far. At NASA, government investment in space continued to yield noteworthy returns, as the InSight probe landed successfully on Mars to study the planet’s interior and the OSIRIS-REx spacecraft encountered asteroid Bennu, with plans to bring a sample back to Earth in 2023. But, one of the year’s most iconic space images was not from NASA or any other country’s government space program; it was a photo of a Tesla Roadster, launched into orbit by SpaceX's Falcon Heavy rocket. The photo also symbolized the expanding role of private companies in the exploration of space—a trend that has been encouraged by the U.S. government as it seeks to outsource the exorbitant costs of its space program. The Trump administration has even been exploring the possibility of turning the space station into a commercially run venture after 2024. 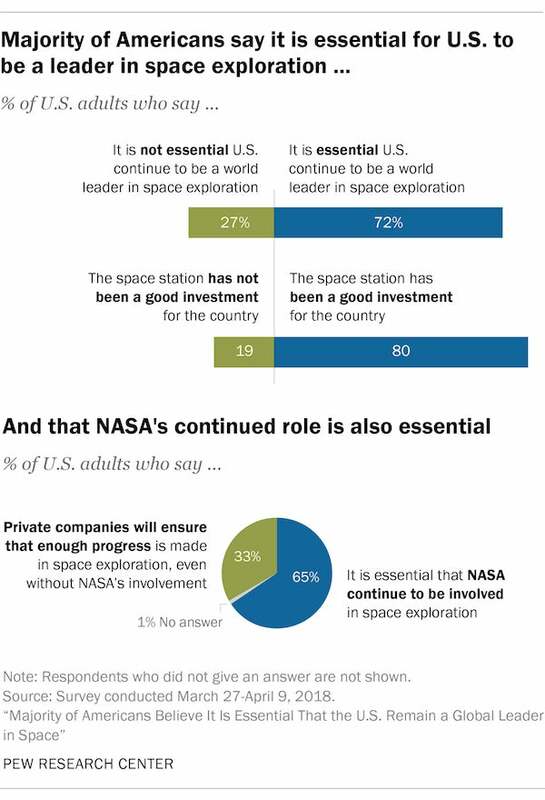 Despite these trends, Pew Research Center finds that 65 percent of Americans believe NASA should still play a vital role in the exploration of space, while a third (33 percent) say private companies will ensure enough progress is made in this area even without NASA’s involvement. And although most Americans believe that NASA still has an essential role to play in the exploration of space, many express at least a fair amount of confidence that private companies can make meaningful contributions in such areas as developing safe spacecraft and conducting research to expand scientific knowledge. One year after a New York Times investigative article exposed sexual assaults and harassment in Hollywood, more than 200 male executives whose misconduct was exposed by the #MeToo movement have been dismissed from prominent companies and organizations. While the movement began in the entertainment and media industries, it has since expanded to include Wall Street, politics and Silicon Valley. Indeed, a pervasive culture of discrimination persists in STEM jobs more broadly. Women and minorities remain underrepresented and report facing a more hostile work environment. 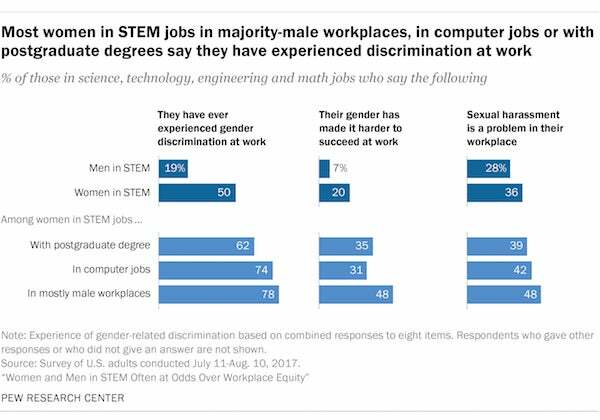 Pew Research Center finds that half (50 percent) of women in STEM jobs say they have experienced any of eight forms of discrimination in the workplace because of their gender—more than women in non-STEM jobs (41 percent) and far more than men in STEM occupations (19 percent). The survey also finds a higher share of blacks in STEM jobs report experiencing any of eight types of racial/ethnic discrimination (62 percent) than do other STEM workers, with many saying they have been treated as if they were not competent because of their race or ethnicity (45 percent). Mark Strauss is a writer/editor focusing on science and society at Pew Research Center.